It is believed that just over half of council tenants sent letters asking them how they dispose of their rubbish have responded. DUBLIN CITY COUNCIL tenants who don’t respond to letters asking them how they dispose of their rubbish could find action being taken against them. The council announced in April that it would be writing to its own council tenants to ask them to inform them who they have a waste disposal contract with. This was described as a “proactive way of trying to highlight the issue” of illegal dumping, according to Brendan Hayden, Assistant Area Manager for the central area for Dublin City Council (DCC). He said that to date they have sent out letters to two quadrants, and have sent a reminder letter to one quadrant, with a reminder to be sent out to the second quadrant soon. Hayden said that so far they have seen a 50 per cent response rate to the letters, indicating that people are buying tags or they have a contract with a waste collection operator. That is “somewhat low as far as we are concerned”, said Hayden, adding that the council will be following up with other tenants who have not responded to the letters. We would take the view that if they had not responded they would have [been] illegally disposing of their waste. Action could be taken with regard to tenancy agreements, said Hayden. The North Inner City Litter Action Group (NICLAG), of which Hayden is a member, is concerned at the number of council houses where people are using tags and bags to dispose of rubbish, rather than bins. They believe it would be easier and cheaper for people to use bins where they have the space for the bins in their residences. “We would say that the use of bins as against bags would turn out to be cheaper,” said Hayden, adding that the issue could be dealt with by the council’s housing department. NICLAG has raised that issue with the council’s housing department as something they would like to see happening, “as waste collectors themselves would like to deal with bins as opposed to bags”. If people aren’t prepared to pay for bins, Hayden said the council could pay for them but offset the charge against it using rent paid by the tenant. The council would pay the waste collector for the bins but the tenant would use their rent payments to pay back the money used. Email “Council could 'take action' if tenants don't prove they dump rubbish legally”. 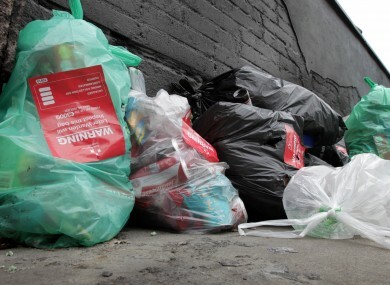 Feedback on “Council could 'take action' if tenants don't prove they dump rubbish legally”.